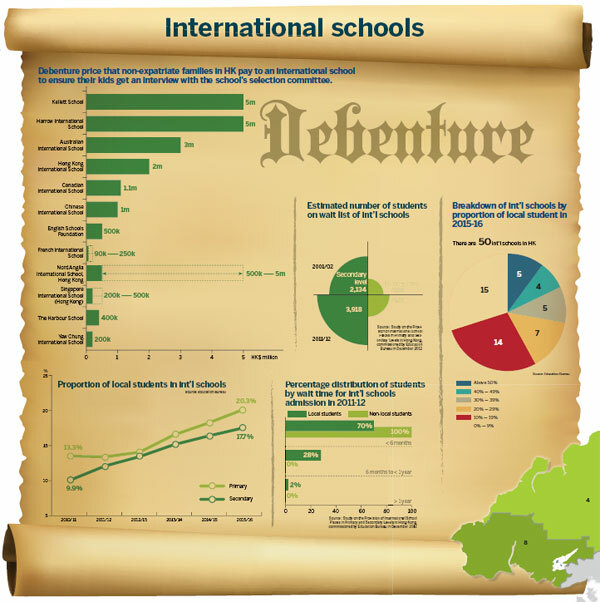 International schools sell debentures offering little in the way of return. China Daily investigates if schools can be held accountable for what they earn. Something seems awfully wrong when private schools are able to hold up parents to unregulated charges looking a lot like highway robbery. Parents want their kids to get the best education money can buy, so they're paying between HK$100,000 and HK$5 million, to grease the wheels at the best international schools, to buy school debentures. They're not like ordinary debentures. They carry no interest, nor do most of them make promise of a return on principal. They don't even assure enrollment. The only assurance is that one kid per debenture gets an interview by the school's selection committee. After all that, if the poor kid fails the selection interview, parents are left with a very expensive piece of paper. But then, all is not lost. Guan Li, for example, thinks he got off lucky. It cost him just a quarter million to get his son into Discovery Bay International School, the school of his choice. Guan had no idea competition was so intense. Applications were already closed when he applied on behalf of his son. "Because we applied late, the staff advised me to buy a school debenture," Guan said. Back then in 2009, debentures sold at HK$150,000. Trouble was they'd been sold already but Guan learned that he could get one from a friend, whose son flunked the interview. Guan was happy to pay an additional premium of HK$100,000 on the face value and his son was accepted. International schools weren't built for local kids. They serve Hong Kong's insatiable need for overseas experts, who won't come here unless their kids have access to the best schools. International schools take the Western approach which is popular among local families. To encourage international schools to come to Hong Kong, the government gives them a break on land use fees. Some pay no fees at all and there are other concessions. In return, the schools guarantee that at least 70 percent of seats go to foreign students,or kids from English speaking families in Hong Kong. That gives rise to the intense competition among local families for the remaining placements. It's a sellers' market. The entrance interview is integral to admission. The issue of who gets interviewed and who doesn't, provides the foundation for new "profit centers". Some schools set out a scale or priorities, so local parents may learn how much it'll cost to maximize their child's chances to be granted an interview - otherwise allocated on a first come, first served basis. The admission webpage of Hong Kong International School (HKIS) advises parents, for example, "debentures are not mandatory, but debenture holders do receive priority." The Kellett School website promises that "Individual Debenture nominees can be expected to be allocated at least half the available places in the school." Not all debentures are optional. The Australian International School Hong Kong and the German Swiss International School require debentures be purchased on behalf of every student that is enrolled. There are 50 international schools in Hong Kong. Among the 28 schools that issue debentures, only the 15 under the English School Foundation post their annual reports online, disclosing debenture income along with other income and expenses. Some go under different names like, Nomination Rights, Capital Certificate, Foundation Certificate and even Capital Contribution. The city's international schools offer around 41,000 places a year. It's not enough for all the applicants and the situation could get worse. The Education Bureau (EDB) warned in 2013, that the 2016/17 school year would see a shortfall of 3,367 places for primary students and 458 places for secondary students at international schools. It doesn't seem the dire prediction is being borne out. The EDB's written reply to the Legislative Council for the 2015/16 school year revealed 2,000 unfilled seats for primary and secondary students. It turned out that some schools had to turn away students, while others were under-subscribed. School tuition fees are regulated but school debentures are on a list of miscellaneous charges that international schools are allowed to levy without government approval. "Ten to 20 years ago, debentures were mainly bought by big corporations to help with relocating expatriate families. They offered assurance that children of expatriate families could attend good schools. Nowadays the use of debentures has changed," said Ruth Benny, who runs an admission consultancy, Top School, in Sheung Wan. She added that families holding only Hong Kong passports or Chinese passports have little or no advantage when it comes to English proficiency. Buying debentures lets them "jump the queue". Data from the EDB shows that in the 2014/15 school year, local students accounted for 17.5 percent of a total of 36,635 students at international schools. Two years earlier local students comprised only 14.5 percent of the total. Mary Ewing, the admissions director of American School Hong Kong (ASHK), said the majority attempting to buy the school's debentures are local people. The competition for admission is "pretty strong," she said. The school won't officially open until Aug 30. At ASHK, the percentage of local students is restricted no more than 15 percent. Despite their evidently extortionate prices, debentures remain popular among local parents able to pay the price. HKIS' debentures, issued four years ago, are now fully subscribed. There's a waiting list six years long. Harrow International School issued debentures at HK$600,000 when it came to Hong Kong in 2012. They sold out the same year. "There is always a market for debentures issued by well-known international schools," said Raymond Kwok. He works for B.A. Marketing & Co. Ltd., a company that deals in buying, selling and renting memberships for golf clubs, social and recreation centers, marinas, and school debentures in Hong Kong, Macao and the mainland. Kwok noted that only two international schools - the Chinese International School (CIS) and the Harrow International School - allow their debentures to be sold on the secondary market. The resale price for CIS' debentures listed on the agency's website is HK$4.5 million, 350 percent of the issue price. Other than these two schools, debentures subject to transfer must go through the schools, not the secondary market. Some schools even levy a transfer fee. Ming Pao reported in early 2015 that the Canadian International School received HK$8.52 million in 2013 through debenture transfer fees. Traditionally, debentures are like loans, repayable on a fixed date at a fixed rate of interest. Unlike loans they are not backed by assets, but by the good credit of the issuer. In Hong Kong, all publicly offered investment instruments must be registered with the Securities and Futures Commission (SFC). Investment vehicles under the collective investment scheme require SFC approval. "The key (of whether a product should be registered or approved by SFC) is that investors generally get return from the investment," said senior lecturer Lee Siu-po from the Faculty of Business Administration at the Chinese University of Hong Kong (CUHK), "for some debentures issued by international schools, they do give return to holders." The Nord Anglia International School says on its website that the HK$500,000 individual debenture is refundable but at depreciated prices, while the corporate and platinum debenture, priced at HK$2 million and HK$5 million, are not refundable. The problem lingers on whether the international schools intentionally withhold returns, explicitly to avoid becoming subject to regulation. An SFC spokesman did not reply when asked whether school debentures should be regulated, but said school debentures are unlike any other instruments in the market. Schools offering debentures list on their websites that the debentures are used to finance the schools' daily operations, maintenance, new campus construction and acquisition of new facilities. The schools are non-profit organizations and receive no capital grants from the government. John Jalsevac, ASHK's school director, said parents are viewed as partners in developing schools. "They are interested in building an excellent school for their children and know that funds are needed to attract top quality teachers and to provide excellent resources. They don't want their children's education to be compromised or sacrificed," he said. ASHK offers individual debentures (HK$600,000) and corporate debentures (HK$3 million). Neither is transferable or refundable, but they provide the debenture holder with a waiver on the capital levy. "It is understandable that self-financing schools want stable cash flows, like income from debentures, to sustain their operations. But such charges are in a grey area since no government regulations apply," said Lee. "Even though international schools in Hong Kong enjoy good reputations and are financially sound, the rights of customers who buy the debentures should be protected," Lee said, adding a clear and open-to-all annual financial report from international schools would benefits both sides. Thomas, a father who wouldn't give his surname, said he suspects non-profit schools use debentures to create hidden profits. His son recently was admitted to Nord Anglia International School, whose debentures are priced from HK$500,000 to HK$5 million. "It is just hard to believe that the schools use all the money for improvements. It is really a large amount," he said. Debentures are not limited to Hong Kong. Two of the top 10 school in Singapore, recommended by Chinese mainland education consultancies, sell optional debentures. Willa Wu contributed to the story.